Caverswall Castle's history stretches back almost 750 years – it's now looking for a new owner to pick up the mantle. No building reaches an age of three-quarters of a millennium without a huge amount of care, restoration and re-imagination by successive generations. That’s precisely what has happened with Caverswall Castle, near Stoke-on-Trent and a few miles south of the Peak District National Park. The pictures on this page speak for themselves: this is a breathtaking 18-bedroom home that comes with 20 acres of grounds. 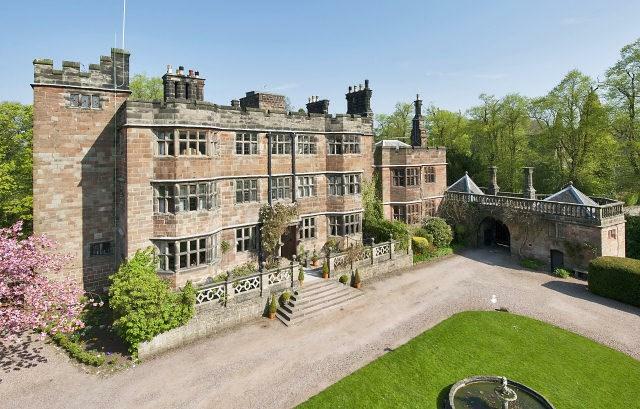 The building – currently for sale via Paul Carr and Remax for £4.95 million – dates back to 1275, when Sir William de Caverswall built a castle on his existing estate. Caverswall’s various ups-and-downs in succeeding centuries saw it decline gravely, at one point even being completely untenanted at the turn of the 17th century. It found a saviour, however: a successful wool merchant named Matthew Cradock, later an MP, who bought it in 1615 and carried out a complete rebuild, albeit one sticking largely to the original footprint. 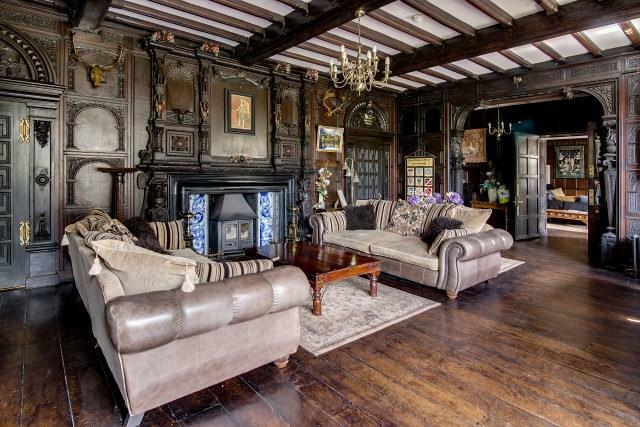 “The new building followed Elizabethan traditions and, happily, involved a minimum of alteration of its original character,” reads a 1932 article from Country Life (one of several on Caverswall over the years) when the place was being sold by Hampton & Sons. The piece explains that the work done by Cradock was grafted on the existing medieval frame, a period piece from the day it was finish with crenellations and arrow slits that were for show rather than function from the day the stones were laid. That sense of revelling in archaic features pervades the place today. 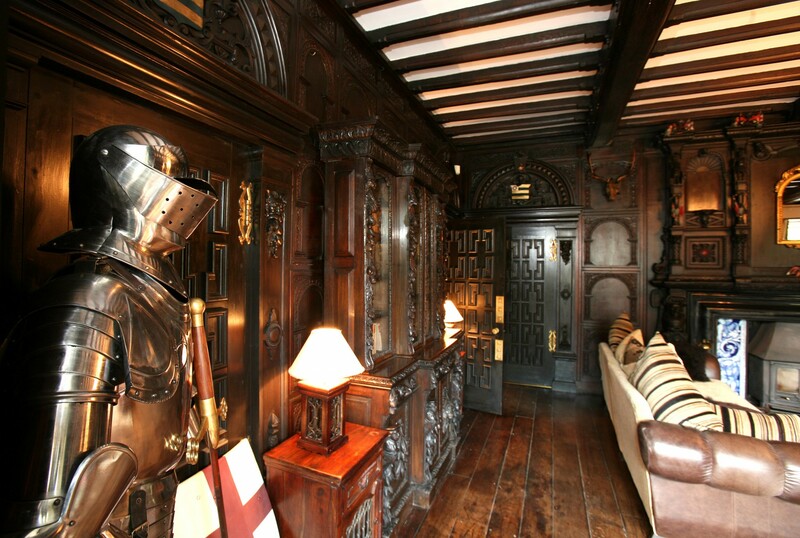 The current owner has ensure that period wood panelling, four-poster beds and all sorts of other touches are present – there’s even a suit of armour, making it feel a little like a film set from Ivanhoe. The library is particular noteworthy – we even picked it out for special attention last year as the sort of room that would tempt you into buying an entire house. All that isn’t to suggest that there aren’t modern features. The work done to the castle by owner Robin MacDonald – who has spent 11 years battling with several local residents and a few planning officers – has seen the addition of a gym, snooker table and Jacuzzi baths, for example. MacDonald – who has mostly used the place as a family home, other than hosting weddings at weekends – is far from the first to have changed the use of the place. 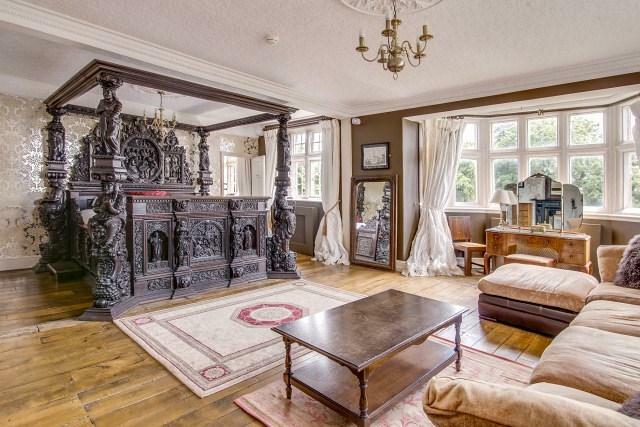 It was a Benedictine convent in the 19th century, for example, and in the latter half of the 20th century was a B&B. At times, the moat has been full of water; at other times, it’s been turned into gardens. At times it’s been pristine; at other times it’s been falling to pieces. Today, there is planning permission in place to turn Caverswall into a sort of upscale wellness centre-slash-retreat. Whether the new owner will want to go down that route or find another remains to be seen, but there will surely be plenty of options – especially given the fact that its 750th anniversary is but seven years away. Whatever comes next, we’ve little doubt that Caverswall’s history will still be colourful and varied for many hundreds of years to come. 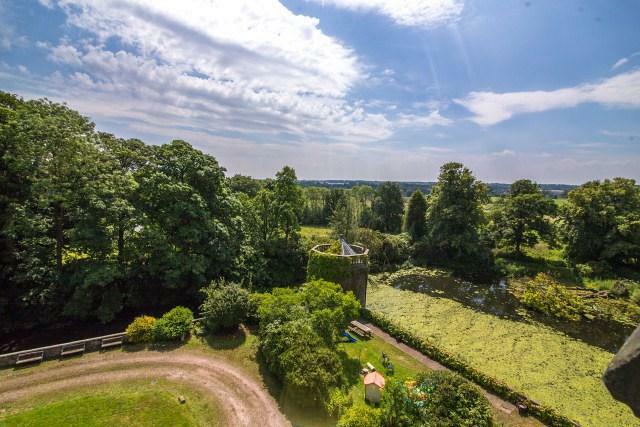 Caverswall Castle is for sale via Paul Carr and Remax – see more pictures and details.